San Diegans are expected to go to the polls in record numbers on Tuesday to nominate presidential candidates and decide key local races and propositions. Polls are open from 7 a.m. to 8 p.m. on Tuesday. If you don’t know your polling place, you can check online. If you can’t vote in person on Tuesday, and didn’t request a mail ballot, you can vote in person at the San Diego County Registrar of Voters on Sunday and Monday. The office at 5600 Overland Avenue in Kearny Mesa will be open from 8 a.m. to 5 p.m. both days. Mail ballots must be received by Tuesday. If you forgot to mail yours, you can drop it off at a booth in the registrar’s parking lot, or at many public libraries around the county. Voters registered with no party preference can request a ballot with Democratic Party, American Independent Party, or Libertarian Party presidential candidates when they arrive at a polling place. Only registered Republicans can vote in that party’s presidential primary. State law allows workers up to two hours off, without a loss of pay, to vote if they do not have enough time to do so in their non-work hours and have informed their employer in advance. There are hundreds of candidates and numerous propositions. Check out Times of San Diego’s Voter Guide and Proposition Guide for help. You don’t have to vote in every race, but whatever votes you cast will be counted. 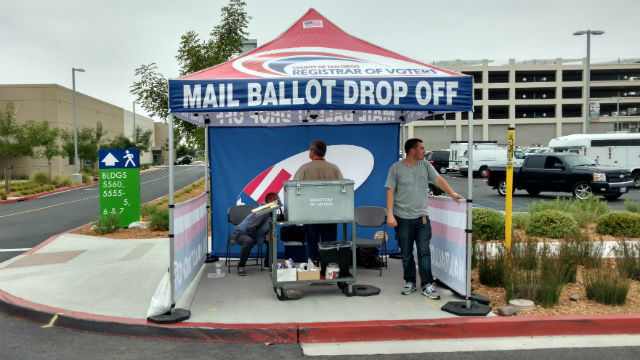 More than 900,000 mail ballots were sent out by the registrar’s office and, according to the nonprofit inewsource, around 28 percent had been returned by Friday. Statewide there are a record 17,915,053 Californians registered to vote, with a surge of nearly 650,000 registering in the last 45 days.